Psagot Insurance Company (P.I) Ltd.
For over three decades, Clal Insurance Enterprise Holdings Ltd. has provided <?xml:namespace prefix = "st1" ns = "urn:schemas-microsoft-com:office:smarttags" />Israel with comprehensive insurance solution, investments and pensions to private and corporate clients. The Clal Insurance Enterprises Holdings Ltd. Group is part of the IDB Group. The IDB Group owns 55% of its shares, while Bank Hapoalim holds 10%, with the rest held by the public at large. Clal's shares are traded on the Tel Aviv stock Exchange The Clal Group holds a 19% share of the insurance market and manages hundreds of billions of Shekel-denominated assets. Clal Insurance Enterprises Holdings ("Clal") is rated A- by Standard & Poor's Maalot. The group owns insurance agencies, pension funds, provident funds, advanced training funds, loan companies and financial asset management companies. The group has about 4,000 employees and works with 2,000 insurance agents. 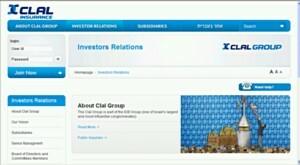 All these activities place Clal as Israel's leading insurance, pension, and financial services group.